Barnsley businesses are being encouraged to shake off the January blues by signing up for Barnsley Hospice’s annual ‘Accumulator Challenge’. The charity fundraiser sees teams given £28, with the aim of turning it into as much money as possible during the 28 days of February. Prizes will be awarded to the team that makes the most profit, and the team with the most innovative fundraising idea. Last year 15 organisations took part, including Barnsley Norse, Barnsley College and Wilbys. Over £9,000 was raised for patient care. 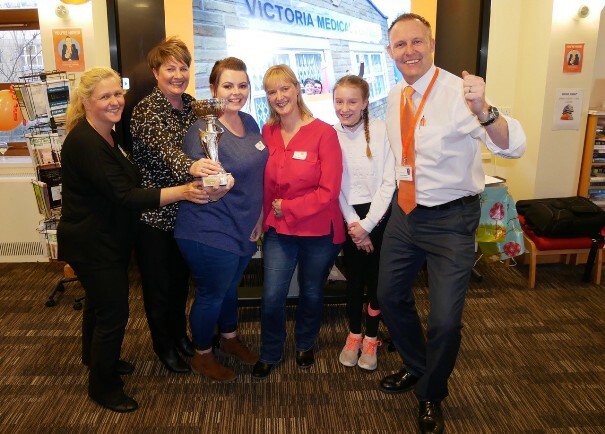 The 2018 winners were Victoria Medical Centre, who generated £2,200 through a pop-up café, a race night and a scheme which allowed staff to “buy” time off work. Alice Vickers, practice administrator, is now throwing down the gauntlet to other organisations. She said: “We had so much fun last year and every member of staff at Victoria Medical Centre got involved. We’ve signed up for 2019 and I challenge Barnsley businesses to take our trophy away from us! Businesses can enter more than one team if they wish and teams are encouraged to think of creative ways to raise as much money as possible. Last year’s ideas included a sponsored diet, a tripe and pig bag eating challenge, and even setting up a brand-new gift card business. 2019 marks Barnsley Hospice’s 25th anniversary, so the aim is for 25 teams to take part to mark the occasion. To sign up to the Accumulator Challenge, or to find out more, businesses can contact Simon Atkinson on 01226 323629 or at simon.atkinson@barnsley-hospice.org.